Lee has a very unique appearance. 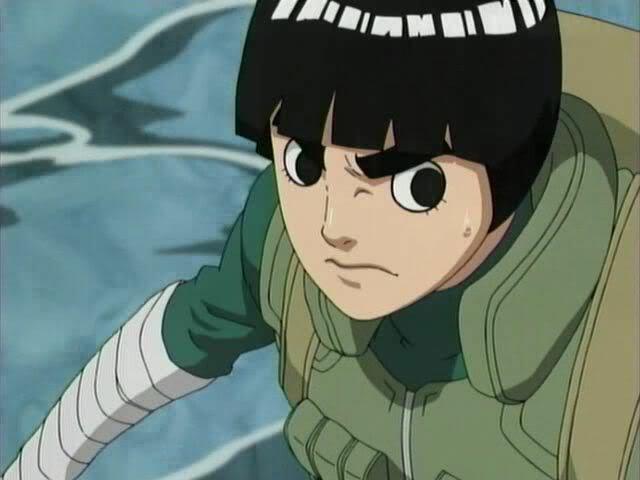 Unlike most other characters in the series, Lee possesses very thick eyebrows (leading to the nickname "Bushy Brows" by Naruto) and large, perfectly round black eyes. During his academy days, Lee's hair was much longer and done in a braid and his attire had more of a traditional Chinese appearance. After joining Might Guy's team, his appearance changed considerably to emulate his idol and sensei. His hair is cut and styled into a shiny bowl-cut like Guy, and also begins wearing the same attire, consisting of a green jumpsuit, orange leg warmers, and wearing his red forehead protector as a belt. The only attire different Lee has to his sensei is regularly wearing bandages around his hands and wrists, a trait that is due to his regular taijutsu training. During Part II, his appearance has changed the least out of his friends. The most noticeable changes are that he has grown considerably taller and wears a flak jacket to further emulate his sensei. Personality:Lee has a number of other odd personality traits, though whether or not they are results of Guy's mentorship is unknown. One such trait is his apparent lack of common sense, believing at times that he can get what he wants by not wanting it. At other times, he takes copious notes, but forgets that he cannot check them during a fight. He also has a keen sense of honor and respects his opponents, refusing to hold grudges against those who have defeated him and returning favors to those that have helped him. This is shown by his readily befriending Gaara and forgiving him for crushing his arm and leg and putting him in the hospital. Lee feels others should show the same respect towards their opponents, and is disgusted whenever someone is unnecessarily cruel to their enemies. Lee is known for speaking respectfully to others, being very proper in both English and Japanese language versions, and never using contractions or swearing. He also uses formal Japanese, applying proper titles ("-san", "-kun", etc.) to anyone he meets. His relationship with Guy has also caused him to acquire many of Guy's traits; in addition to his personality, his dedication to his promises as well as his belief that one cannot dislike food are characteristics of Guy. Lee's attempts to prove and better himself are recurring themes for his actions throughout the series. He is generally optimistic and believes that with hard work and passion, he can surpass a natural genius, but can be prone to depression when faced with setbacks. His drive to succeed is initially most evident with his rivalry with Neji Hyuga, having learned from Guy that having a rival will provide incentive to succeed. Neji, a "genius" ninja, finds Lee's efforts of bettering himself to be in vain, believing Lee to be stuck as a "failure" for the rest of his life. Specialties: tai jutsu master with few weapons training. Description:This technique involves a powerful leap forward followed by a spinning kick with both legs in succession, the second kick being aimed lower in case the intended target ducks the first. Description:The Shadow of the Dancing Leaf is used to position a ninja's opponent into a vulnerable aerial position. The ninja will first quickly appear below their opponent, then with a swift upper kick they will launch their target into the air. The ninja will then jump into the air to "shadow" the target with the target's back to their chest. Since this is the opponent's blind spot, it can be used as a set up to a number of jutsu. Rock Lee uses it in preparation for the Front Lotus. description:It can not be learned, nor can it be taught, or honed and refined through training and practice. According to Might Guy; Drunken Fist is a Kenpō/Taijutsu style where, "the more you drink, the drunker you get, and the stronger you become". Drunken Fist Fighter's are not simply drunk, they become human powerhouses' who'll strike unpredictability, with no inhibitions, an explosive fury and without any second thoughts about their actions. While under the influence of Drunken Fist, Rock Lee's approach in his strikes are discribed as 'unpredictable' because, as he is drunk, he is infact not thinking of his next move ahead. description:This jutsu is an advanced and more destructive version of the Front Lotus, which requires that at least three chakra gates be opened (in every instance in which it has been used, five gates are opened). Once enough gates are open, the user launches the target into the air and strikes them at inhuman speed before hitting them with one arm and one foot, sending the target crashing into the ground. This is usually fatal due to the speed and power behind the attack. description: Strong Fist is Guy's and Lee's characteristic fighting style, the purpose of which is to cause external damage and break bones. Gate of Opening: located in the brain. Releases the instinct restraints on the bodies muscle. Unlocking the gate allows the user to use the Front Lotus. Gate of Healing: located in the brain, raises the user's stamina. Gate of Life: located on the spinal cord. Releases the limit on the nervous system allowing information to travel at a much faster rate. A side effect is that the user's skin turns red. Allows the user to use the Reverse Lotus. Gate of Pain:located on the spinal cord. Increases the user's speed and power. May cause muscles tissue to tear on use. Gate of View:. Allows the user to perform the Morning Peacock. Opening of this gate releases such large amounts of chakra that it can cause nearby water bodies to form a vortex around the user. Gate of Wonder:allows the user to perform the Eternal Chaotic Dance. Gate of Death: opens the final gate located at the heart and uses up all of the body's energy. It makes the heart pump at maximum power and exceeds the power of every other gate. History: Although Lee did not start out this way, he has always been a hardworking and an overly-persistant character: During his time as a student in the Konoha Ninja Academy, Lee's stubborn attempts at learning to use--and failure to perform basic level Ninjutsu and Genjutsu--were mocked by his fellow students, (and apparently even most of his Chunin-sensei had no kind words to offer to him, (with the possible exception of Iruka Umino)). Rock Lee was labeled as just another failure, and the 'Dead-Last' of his graduating class. Only in the area of Taijutsu could Rock Lee make any progress, putting much effort into it, and in the end became the only student in his graduating class to graduate using only Taijutsu. Under the tutelage of his Jonin-Sensei, Might Guy, (whom he always addresses and refers to as "Guy-Sensei", and from whom Lee got his more-extreme personality traits,) Lee now focused only on his Taijutsu, specializing in the Strong Fist Taijutsu Style, and trained ardently to prove that, even without any Ninjutsu or Genjutsu in his repertoire, that he too could become a "splendid ninja". As such, Lee resolves to prove Neji wrong, and confronts another "genius", Sasuke Uchiha, in an attempt to test his worth. While Lee maintains the desire to defeat Neji in a fight throughout the Chunin Exam arc, after Neji's eventual defeat by Naruto Uzumaki, another labeled "failure", Lee becomes less interested in this goal. Neji's rejection of his previous belief in fate may also have contributed to this, as he now respects Lee, believing that he will surpass the gifted with enough work. Shortly after his introduction, Lee reveals that he likes Sakura Haruno, asking her to be his girlfriend and vowing to protect her immediately after they meet. While she does not seem to share these feelings for him and considers him weird, Lee maintains these feelings and goes out of his way to help her throughout the Chunin Exams. Sakura becomes more appreciative after this and punches Naruto whenever he insults Lee. Despite this, Sakura does not seem to return any romantic feelings for Lee, as she refers to him by the more formal "Lee-san", as opposed to "Lee-kun". 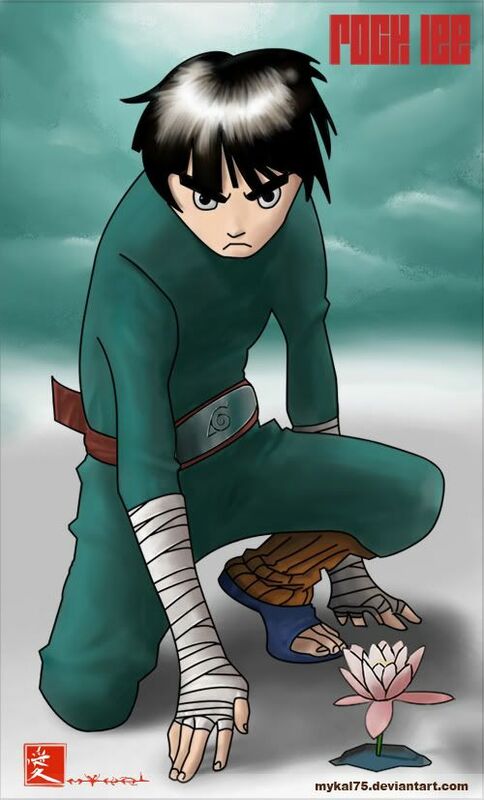 Roleplay Sample: rock lee's upper brow was covered in sweat, he was walking on his hands around the village and was 1,000 times and was on 674. "almost their" he though, he fell down "darn it" he said as he got up and did 100 quick push ups. he countined training for a 6 hours his, upper arms were burning with pain but that only meant that the muscles were building up. "5 more laps and im done" his finished and now his body was covered in sweat and was eaxhausted. "must finish faster" lee had to be home soon because he wanted to go home and eat already. "okay 4 more laps now" le bit his tounge, walking on yoyur hands is difficult and he didnt want to lose balance only the last few. "2 more now, push yourself lee push it" he tried motivating himself his legs were beggining to wobble and he had one more lap to go. " YOUTH!!!!!" he screamed as he gave everything he got to finish his last lap and as soon as he crosssed his finishing spot he laided down. "GAI SENSAI I DID IT!" he screamed outloud gai wasnt theire but he knew gai would be proud if he knew what lee just did he could feel tear welling up in his eyes so accomplished and full of pride. he walked home and laided back in a warm bath, his muscles were exausted and he took his time relaxing in the tub. after that, he got out and got dressed, laided back in his bed and closed his eyes for tommorow he had alot more training to do. More on the RP Sample.